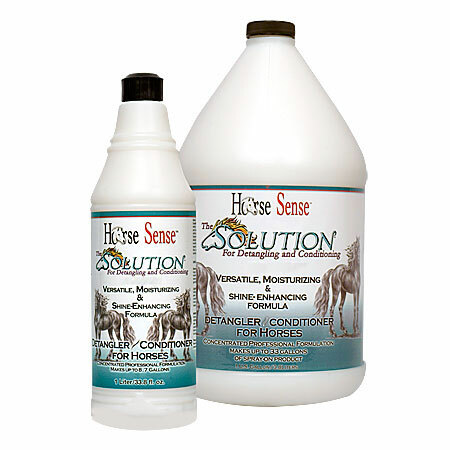 Horse Sense™ Solution for Detangling and Conditioning™ is an extraordinarily versatile product which will help detangle the most difficult mats and/or condition a wide range of coat and hair types. Extreme concentration creates great value. May be highly diluted for leave-in detangling spray or used straight to help loosen tough mats. Humectant and emollient rich formula is gentle and may be used regularly for beautiful show ring results. Great for dry, rough hands also. Excellent for use on dogs, cats, horses, rabbits, llamas and most other animals. Concentrated professional formula where one gallon makes up to 33 gallons of spray-on product.